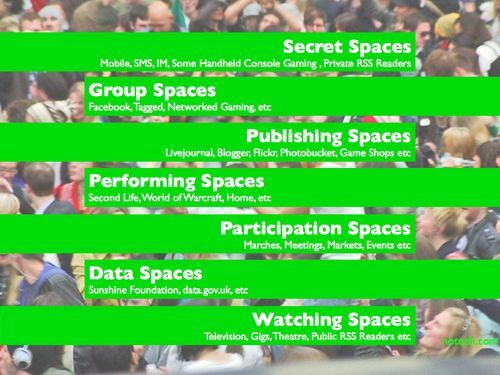 Posts Tagged as "learning spaces"
While I’m on the topic of designing new schools, here’s a great article by Ewan McIntosh on applying the seven digital spaces to creating new school spaces. McIntosh points out that every school needs all of these physical spaces, even though most schools are primarily geared towards “watching spaces” and prevent people from collaborating or talking to each other. The article asks, Can we design schools around the kind of teaching and learning you’d like to do, instead of the teaching and learning you already do? Can we design schools that, instead of being “big things that do wonderful stuff for people” “allow people to create great things for themselves”? This article is chock-a-block with great links and thoughtful ideas. Check it out! I wonder what Ewan McIntosh and the creators of the Green School would think about each other. I feel like they’d have a lot to talk about! Thanks to Vicki Davis for posting about this on her blog and bringing this post to my attention!